Community exists between word and sacrament – preaching and sharing at the table. Within the bounds of this definition come prayers and fellowship. The word we translate as fellowship is the Greek word koinonia. Koinonia is not the coffee hour. It is instead the life described here in Acts 2 and again in Acts 4. Fellowship describes living in community in such a way that everyone’s needs are addressed. As Luke puts in Acts 4, “the whole group of those who believed were of one heart and soul, and no one claimed private ownership of any possessions, but everything they owned was held in common. . . . There was not a needy person among them” (Acts 4:32-35). This decision to share goods was a voluntary one. One who embodied this life of generosity, was Barnabas who shared generously his abundance with the community. Of course there is that other story, about a couple who pretended to give generously but didn’t. You may know them as Ananias and Sapphira. While Barnabas goes on to serve as Paul’s co-worker in his first missionary journey, Ananias and Sapphira have a rather unhappy ending to their story as seen in Acts 5. Even if Luke’s account is an idealized memory of a short-lived experiment, we still catch a glimpse of life in the Realm of God. Instead of focusing on personal salvation, these early Christians came together as a community and shared life together as followers of Jesus. As a result, due to the generosity that each shared, no one was in need. Everyone contributed what they could to the welfare of the entire body. Last week Carol Howard Merritt called on us to be a People of Hope. As we return this morning to our series on stewardship, we again hear a call to be People of Hope. We hear a call to share gifts and talents with the community so that all might share in God’s abundance. 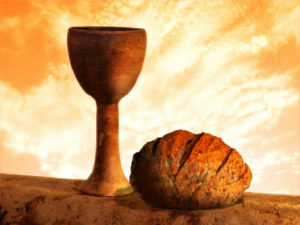 Because of their commitment to living in community under Jesus’ guidance, Luke reports that they broke bread with “glad and generous hearts.” The attitude expressed here parallels Paul’s description of the church as the Body of Christ. Each of us has different gifts, and each of us contributes to the working of the body. The eye can’t say to the ear that it is more important. I was just reading about how preachers in the Social Gospel Movement pointed to baseball as a good analogy of what Christian community should look like. In baseball, teams will be successful when every part is working together toward a common goal. You can have the best player in the league and still not win. You need a full team that includes a quality bench and a steady bullpen. If you watched the most recent World Series, you might remember that the Giants may not have had the best players in the league, but when crunch time came they played as a unit and prevailed. Yes Bumgarner and Panda played key roles in winning the series – but where would they be without the contributions of Jeremy Affeldt, Juan Perez, and Joe Panik. And so it is with the community of the faithful. Each of us plays an important role in the life of the congregation. We each bring our gifts to the Table. They might be financial. As Bob Simmonds reminded us last week, the church as an institution has bills to pay, and so we as members of the community had best not procrastinate when it comes to fulfilling our stewardship commitments. But the community needs more than money if it is going to be used by God. Last Saturday we talked about how many people choose not to attend church because they don’t have any funds to share. In essence, money becomes the barrier to participation in the community. But as we see in Acts 2, the people gave generously in any way they could. It might be money, but it might be some other form of giving. Immediately following the service Kathleen Potter is hosting a soup supper. At that supper she is going to invite us to fill out a little form. On that form we can put down the ways in which we can be of service to members of the congregation and the community at large in times of need. Maybe that would involve taking someone to the doctor or baby-sitting a child. It might mean mowing a lawn for one of the older members or helping a person clean out their basement after a flood. This new program, which Kathleen is instigating, will report to the Elders who will try to match needs with gifts. This is, I think a good example of what it means to live in community under Christ’s leadership. It involves being a good steward of the gifts of the Spirit of God, so that we might share them for the benefit of the community, as we move toward the full revelation of God’s realm. And everyone, no matter how old or young, no matter one’s physical or financial situation, we all have something to share. And no there wasn’t a gate in Jerusalem in the time of Jesus that was called the Eye of the Needle! When we read passages like these ones, we can get a bit worried about our eternal welfare. But it is good to remember that we live in a different context. Luke lived with the expectation that the current age would end soon. But as you know we’re still here two thousand years later. We have a responsibility to provide for our families. And yet, we are part of a community and therefore we do have responsibilities to each other. When we gather at the Lord’s Table we remember not only Jesus’ final meal with his disciples, but we also remember the meals shared by the disciples as they lived in community. Even as they worshiped in the Temple, they gather in their homes and broke bread daily. And like we saw with thefeeding of the 5000, everyone ate their fill and no one was left behind. Yes, this early Christian community gathered for the Apostolic teaching, for prayers, to share community, and break bread. As we come to the Table this morning, with the call to stewardship on our minds, may we come with “glad and generous hearts.” Next week we will bring in the harvest of our commitments to the ministry of this church, and may we do so with hearts filled with thanksgiving.